How long will it take our biosphere to recover from the current climate crisis? How long will it take our biosphere to recover from the current climate crisis? It’s a question that makes for a sobering examination of Earth’s ongoing destruction. And it’s to the past, specifically the fossils of a tiny species that went out with the dinosaurs, that scientists have turned for the answer. Recovering from mass extinction has a “speed limit”, they reveal, with gradual patterns of ecosystem redevelopment and speciation. Just as the planet we now occupy is vastly different to the one known by dinosaurs, the future ecosystem will be even further removed due to negative anthropogenic effects. Palaebiologists from the University of Bristol and University of Texas studied the recovery rate of planktic foraminifera dating back to the Cretaceous-Paleogene extinction. This period provides a unique analogue for our current times as it’s the only major event in Earth’s history that happened faster than modern climate change. Their study shows that global recovery from this extinction, which killed the dinosaurs and left a gaping hole in the biosphere, took around ten million years as new innovations had to first appear, then finer differences or specializations could be evolved. These findings have striking implications for the planet as we know it, as we confront an escalating climate crisis, increasing habitat destruction and the invasive nature of species introduction – a pattern of events that parallel ancient times. 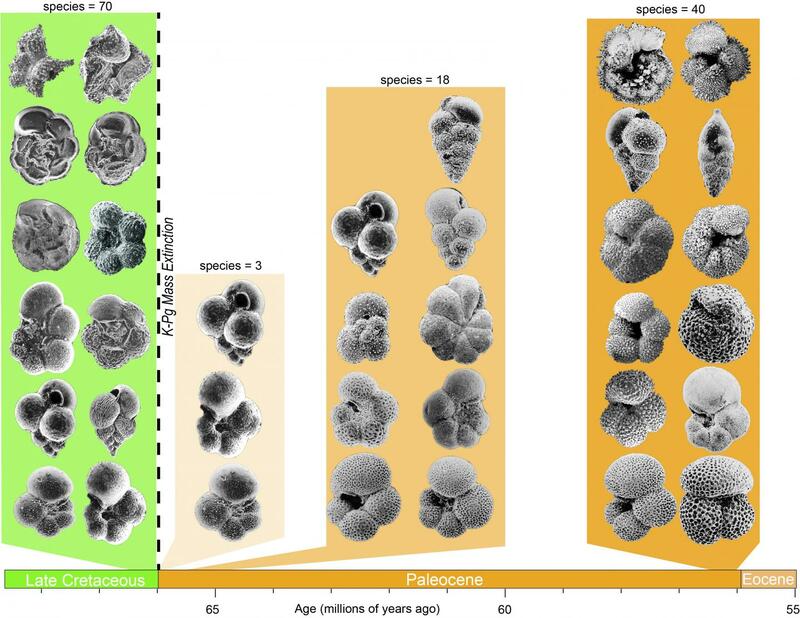 Researcher and co-author of the study, which appears in Nature Ecology and Evolution, Andrew Fraass, said: “Foraminifera are useful at the species level because of their superior fossil record, so we’ve been able to look at this process in a closer way than anybody else. The delay in speciation observed by Fraass and co-researcher Christopher Lowery, was due to the dynamics of morphospace expansion. This explains how species redevelop; first by refilling the broad ecological niches of a recovering biosphere, and then later filling in, or specializing in, the gaps. Fraass and Lowery, from Bristol’s School of Earth Sciences, took measurements of foraminifera to see how similar or different species were. About ten measurements of all species were done, but for this first study Fraass said they were concentrating on just the 20 or so million years around the end Cretaceous mass extinction and recovery. They found that really different species show up first, then the more similar species fill in around those first set. They find that their results match up very well with earlier, theoretical work, from two authors. Having opened this new perspective on the world, past and future, Fraass and Lowery plan to apply their methodology to the rest of the history of the group, from late Jurassic to the present day.